Gloomy Wood is surrounded by dense woodland making it at atmospheric backdrop for the Duel - The Haunted House Strikes Back. The theming throughout the area has a Gothic quality to it, and would strike fear into the bravest of adventurers. For those in search of more laughs and frights, the area has the Haunted Hollow to offer. This path is not only a handy shortcut around Katanga Canyon directly to Mutiny Bay, but is packed with chilling fun. Gloomy Wood was constructed for the 1992 season to tie in with the park's then new Haunted House. Set on the path between Katanga Canyon and Forbidden Valley (known as Thunder Valley at the time) the area is in a seemingly very secluded and untouched spot. In reality however, it neighbours the Monorail depot and the exit of the car parks. 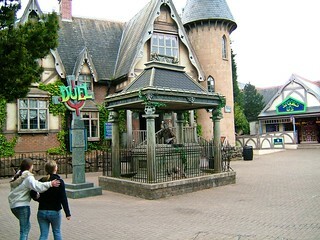 The area remained more or less unchanged through the 90s, with minor cosmetic changes in 2003 with the conversion of the Haunted House to Duel and again in 2007, when Haunted Hollow was opened to the public.